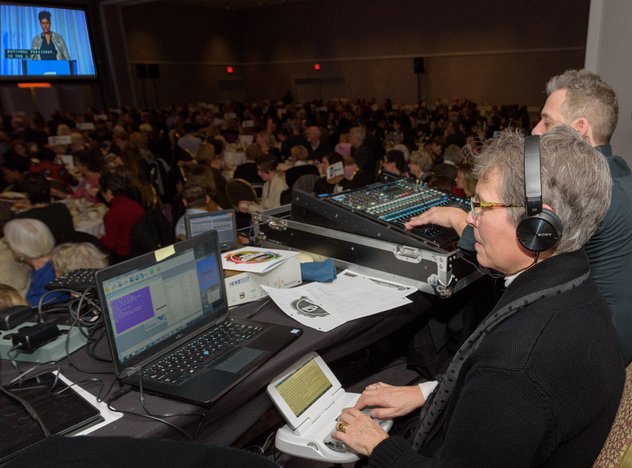 When you need a live event made accessible for people who cannot hear, live captioning is the service you need. 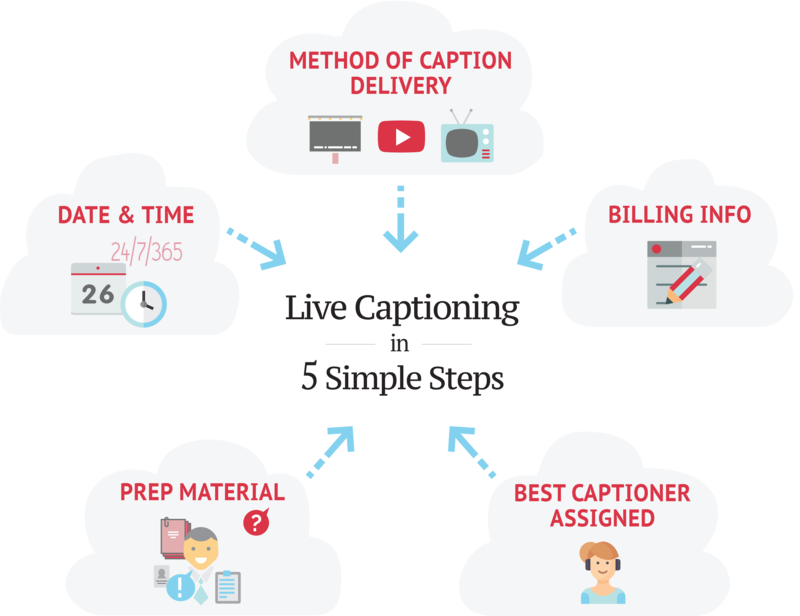 Live captioning is used for newscasts, broadcast sports events, arena captioning, city council meetings, business conferences, concerts, webinars, and more! Live broadcast captions – on TV — are always in the roll-up format, in which individual lines appear on the screen and roll up to make way for the next lines. Feel free to visit our FAQ page to learn more about roll-up captioning and browse our Live Captioning Services to see what we can do for you! Since 1993, LNS has been a leader in providing live captions for broadcast news, sports, and live events. From around the country, we can watch or listen to your broadcast and create captions, which are then sent via modem or the internet to your production facility. The captions remain part of the broadcast signal when that is sent to your viewers. We can also work on location at your production site. We caption a wide variety of programs that include newscasts around the country as well as sports and entertainment, for clients such as Capital One Arena, the New Orleans Superdome, and the Portland Trail Blazers.. Our clients know that when it comes to timeliness, accuracy, reliability, and affordability, LNS will come through for them every time. Live event captioning, also known as Communication Access Realtime Translation – CART Captioning — offers immediate, accurate, voice-to-text translation for events, conferences, classes, public hearings, and government meetings. LNS provides access for people with hearing disabilities, for those new to learning the English language, or for audience members who simply have trouble hearing the audio in a noisy venue. The live captions can be presented on a laptop display for an individual or can connect to a projector to give the whole audience access to captions. For information regarding captioning via webstream, visit our LNS Webstream page. We are seeing an increase in the requests for CART captioning from participants in courtroom proceedings, including litigants, attorneys, and potential jurors. Click here for more information about the best practices for using CART captioning in the courtroom. Advance reservations for this service are necessary. Call us at your earliest convenience to book our captioners. In order to provide high-quality captions, we request scripts or preparation material in advance. We love to spell names and technical terminology correctly, and documents such as the rough drafts of speeches or power point slides are very helpful. LNS Webstream is an easy-to-implement, inexpensive way to communicate your message to your audience – whether your audience is attending the event in person or via the internet, a smartphone, or some other digital device. Our team can provide an event-specific URL for your event that can be used in a wide variety of platforms, including Adobe Connect Pro, WebEx, GoToMeeting, GoToWebinar, YouTube, and many more. LNS StreamCast is an application designed to allow you to overlay captions onto any application that does not have native broadcast captioning support. You can use StreamCast to display our captions over a Power Point file or a webinar platform. These captions can be easily projected on a screen, or simply viewed on any internet-connected device (computer, phone, tablet, etc.). Your audio feed is sent by phone or the web – Skype, Google Hangouts, etc. – to an LNS expert captioner. Our expert captioner creates a live, highly accurate transcription of the spoken word to text. The captions come to you in real time via any connected device – desktop, notebook, tablet, big-screen, smartphone, or other digital device. Click here to request a quote, and click on the link below to download or print our LNS Webstream brochure! LNS can help you provide equal access to information for Spanish-speaking audiences. We can provide Spanish-to-Spanish captions, or English-to-Spanish, or Spanish-to-English captions on TV, for webinars, and for live events. And of course, the quality of the captions is always the best, regardless of the language!